I'm looking to create some funny awards for real estate agents. Let's face it - the industry could use a few good laughs this year. And with office party budgets getting cut, fun awards are a great way for realtors to cut loose and have fun without breaking the bank. I need ideas from real estate agents, apartment managers, appraisers, office staff, mortgage brokers - anyone involved in the real estate industry. I really just need ideas and terms specific to the real estate industry. Don't worry too much about making the awards funny - I can do that. If I get a strong enough response, I'll put the collection together in a new eBook called "Funny Awards for Real Estate Agents" as a companion to my current best-seller Funny Employee Awards. And if I up use your funny award idea in the eBook, I'll make sure you get a complimentary copy when it comes out. My preference is for you to submit your award ideas here. But you can also post in the comments section or email me directly. That's a phenomenal (and budget conscious) idea! How about a certificate saying "Best dream house in Friday the 13th Series: Sold By:"
That's a nice idea Debra! 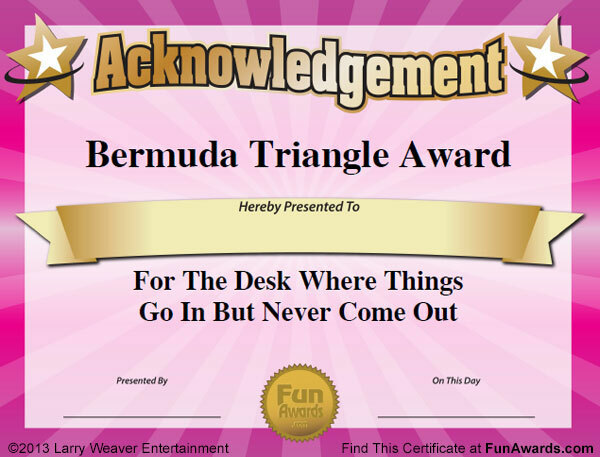 These hilarious award titles encourages them to make the best quality out of their jobs. Those are quite funny award ideas. I think these award titles should also be adopted by home builders in their builder website to motivate their workers.